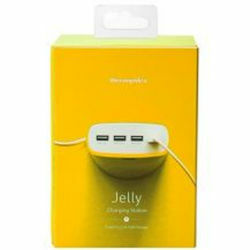 The Jelly is a 5.1A USB charger powerful enough to charge 1x tablet and 3x smart phones at maximum speed. It stands as the size of a coffee mug with a 1.2m power cord curled neatly inside the silicone sleeve. The silicone sleeve is removable thus becoming a compact and light weight charger for travel use. The Jelly is a 5.1A USB charger powerful enough to charge 1x tablet and 3x smart phones at maximum speed. It stands as the size of a coffee mug with a 1.2m power cord curled neatly inside the silicone sleeve. The silicone sleeve is removable thus becoming a compact and light weight charger for travel use.